Ed Kenney Sings "Sweet Leilani"
Uncle Sonny left us more than 10 years ago now. This Frommers entry then either speaks to the editors’ inattentiveness or the seeming invincibility of the gentleman with arguably the longest career in Hawaiian music show business. Who ever thought the immortal Sonny Kamahele could ever die? Certainly not me. Sonny broke into show biz at the age of 19 with his father’s orchestra performing at the two hottest, swingingest night spots in Waikiki of the 1930s and 40s – the Moana Surfrider and the Royal Hawaiian Hotel. By 1948 he headed off to perform at Hollywood’s purveyor of Hawaiian culture, the now famous Seven Seas Supper Club, in a show led by Sam Koki. During this same period, Sonny was doing studio and TV work, performing in the Harry Owens’ Orchestra for his then popular TV show which was naturally produced in Hollywood. Sonny stayed on the mainland nearly a decade, but by 1956 he returned to his home in Hawai`i where one with his immense talents would no doubt immediately find work with a group that would become legendary not only for its all-star members, but also for the company it kept. Benny Kalama enlisted Sonny for a group he was leading called the Hawaiian Village Serenaders, so named for the Hawaiian Village Hotel where the group was performing sometimes twice nightly backing legends of Hawaiian entertainment such as Alfred Apaka and Hilo Hattie. Throughout the 1960s Sonny led his own group at this same hotel’s Surf Room. And at the same time as all of these other 60s engagements, Sonny was also an in demand studio musician who appeared on more recordings than one can count (often uncredited except to those who recognize his guitar playing or his voice), and he was a critically important member of the Hawaii Calls radio program’s orchestra and chorus – lending his guitar and voice for both the radio and (short lived) TV versions of the program as well as on innumerable recordings which found their way around the world courtesy of the shameless promotion of Capitol Records. I knew Sonny personally from the final period of his career which he spent at the Halekulani Hotel’s famed House Without A Key. I used to go listen to him play with The Islanders, a group led by steel guitarist Alan Akaka, at the venue local musicians once referred to affectionately as “HWAK” where they performed for nearly 20 years from September 1983 until Sonny’s retirement in August 2003. We lost Sonny much too soon on February 11, 2004. He was only 82 years old. Like Frommers, I thought Sonny would live forever. But do the math. He passed away less than six months after retiring. He and his wife had just built a house on the Big Island. He never had an opportunity to enjoy it. He gave the best years of his life to the music. Sonny left us a legacy of hundreds of recordings. You would be hard pressed to find the best of these in the digital era. Only his final few solo albums were released in CD format. Sonny’s recorded work as a leader in the 1960s remains out of print, as do the many recordings with the Hawaiian Village Serenaders. And on others still Sonny languished in obscurity as the liner notes of the recordings on which he fulfilled that one-time studio need – on guitar, `ukulele, or bass – rarely credited the sidemen if they were not part of the featured artist’s regular working group. 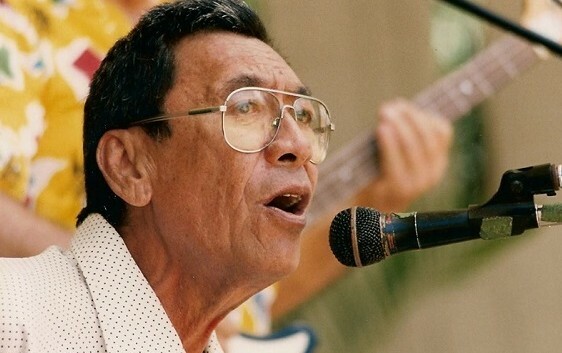 Because Sonny could do everything, Ho`olohe Hou Radio aims to feature recordings that showcase the best of everything Sonny was and continues to be the epitome of to so many of us. During the week of February 7th through 13th you will hear a little of everything Sonny did every day on Ho`olohe Hou Radio – his rhythm guitar, his steel guitar, and – especially – the voice in all of its incarnations. I miss Sonny in as many ways as he had talents. I not only miss his music, I miss his spirit and his kolohe nature. Unlike some of the other relationships I have had the privilege of forging with Hawaiian music legends, it would be disingenuous of me to call Sonny my “friend.” We didn’t know each other well enough. But we shared many a lovely evening after his performances at HWAK, sitting under the kiawe tree hours after the gig ended until Halekulani staff ultimately had to kick us out or sweep around us. He regaled me with stories of a Hawai`i – and a Hawaiian music scene – that I will never knew. Sonny was my hero, but he also personally knew so many of my other heroes that he was my “one degree of separation.” Despite being a legend, Sonny was a most unassuming presence – dressing to the nines in the all-white uniform he himself conceived of for the Halekulani gig (and which the bands which came after still wear to this day), but playing a vintage Gibson archtop so ravaged by time that it was held together with duct tape. And that pretty much sums up the Sonny I will always remember.